Technological advancements in the printing industry means there are now more commercial printing options than ever before. If you’re considering litho printing to produce your printed materials for your offline marketing, it is a good idea to find out a bit more about it to ensure that is the best option to suit your project and discover how it can benefit your business. Lithography is the traditional and most common method of printing used in the production of printed material. Lithographic printing is very economical. It can be used on short run work through to well over a million copies. Using this printing method offers excellent value, a large choice of print substrates and a wide variety of ink and coating options. The process of litho printing was invented over 200 years ago in 1796 and is still considered to be the highest quality form of printing. Although digital printing has come a long way in recent years, there are still many great benefits of using litho printing, one of the main ones is quality. With litho printing you can be assured that your business’s printed materials will be of the highest possible quality. Whether you are printing posters, brochures or business cards you will want to ensure that all of your printed materials are of the highest possible quality as it reflects the quality of your business. 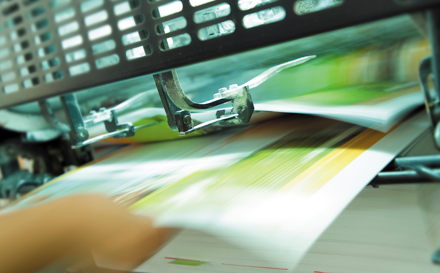 Litho printing can be used to print a range of different materials, such as magazines, brochures, stationery and leaflets and can print on a number of different surfaces. Not limited to just paper, litho printing can be used to print on plastic, wood, cloth, leather and metal – giving your print marketing a unique and creative edge. While printing on a variety of materials will be more expensive, it demonstrates the innovative thinking of your business and can lead to better conversion rates. When producing high volumes of printed marketing materials, litho print will definitely be cost effect and beneficial to your business. The main cost is from the initial set up, so the more material you print the less it will cost you per copy. For example, if your company has a new product range and wants to print a thousand brochures, then litho printing would be extremely cost effective. It is for this reason that litho printing is the preferred option amongst new businesses and start-ups. With the first operational Heidelberg Speedmaster XL75 5 colour and coater press with Prinect Inpress Control and Intellistart in the country, The Lemon Press can ensure all your printing requirements are met using the very latest technology and state-of-the-art equipment. Working with the latest in Apple Mac technology and software, our reprographics team work closely with our print team to ensure a quality that is unrivalled throughout the UK.